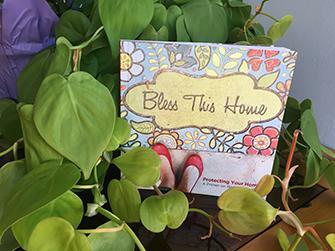 Trying to keep your home healthy for your and your family? A wide range of contaminants might be trying to interfere with your plans. Luckily there's a wide range of indoor air quality services available that can take care of these contaminants and leave you with a healthy home. What indoor air pollutants are in my home? 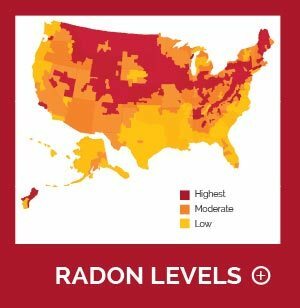 Level 5: Dangerous Gases: This category mainly refers to radon and carbon monoxide (CO), two very dangerous gases made worse by the fact that they are both invisible and odorless. 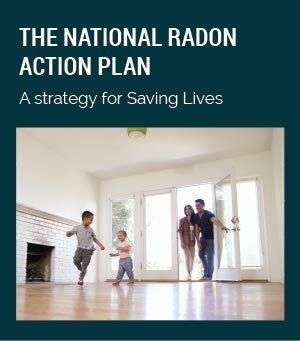 Radon is a naturally occuring gas caused by trace amounts of uranium in the earth's crust. CO is produced by appliances that work by using combustion to burn fossil fuels or wood. Because these are the most dangerous indoor air pollutants you should make it your number one priority to test for both. Level 4: Mold & Mildew: Mold and mildew are both types of fungi that thrive in dark and damp environments. Often they prosper in the hidden corners of your home and reproduce through microscopic spores which they disperse throughout the air. This is the reason they harm your indoor air quality. These microscopic particles get into your lungs and can cause problems ranging from simple irritation to asthma and lung infections. 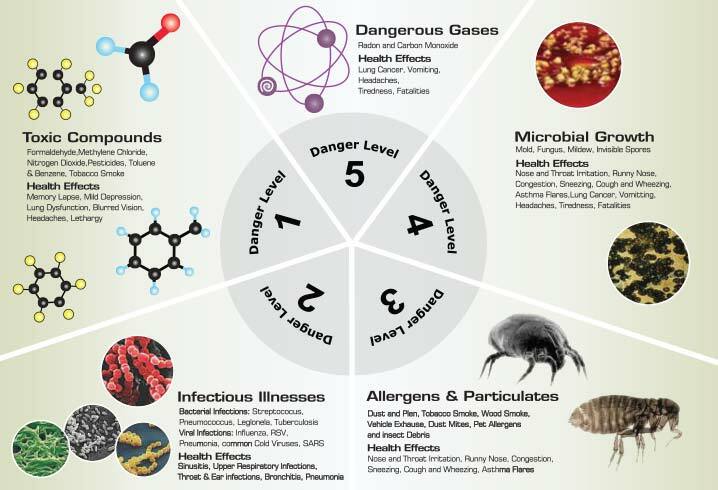 Level 3: Allergens & Particulates: There are a wide range of small particles and irritants that regularly circle throughout your home causing respiratory ailments, eye irritation, and sinus problems. These irritants include smoke, dust, pollen, pet dander, and insect debris. Luckily these elements can be easily taken care of with the use of high quality filters. Level 2: Infections Illnesses: While some infections diseases are spread by contact, many linger in your air as indoor air pollutants. Some of these diseases include influenza, streptococcus, pneumococcus, and many common cold viruses. Improving your indoor air quality with filtration, ventilation, and humidity control can help stop these diseases before family gets sick. Level 1: Toxic Compounds: Many old homes were built with, or had furniture containing, dangerous and toxic compounds like formaldehyde, methylene chloride, acetone, benzene, and more. Some of these compounds can also be found in certain cleaning products. The best way to deal with these compounds is to avoid products containing them, but indoor air quality services can help remove any traces that are already present. How do I find out if I have any indoor air pollutants in my home? Detailing any problems your home might have with heating/cooling, humidity, carbon dioxide levels, and carbon monoxide. Providing recommendation for improving your home's comfort and health. Offering idea to help reduce utility costs. Step 1: Our Air Quality Specialist sets up the required amount of monitors (one or more). This generally takes only 30 minutes. Step 2: The monitor will record data for about a week (5-7 days). This system will measure particle allergens, chemical pollutants, carbon monoxide, humidity, temperature, and carbon dioxide. Step 3: Once the measurement is done we'll receive a report. Our Indoor Air Quality specialist will then return to your home to deliver your report, explain the results, and suggest the best solutions for your home based on said results. 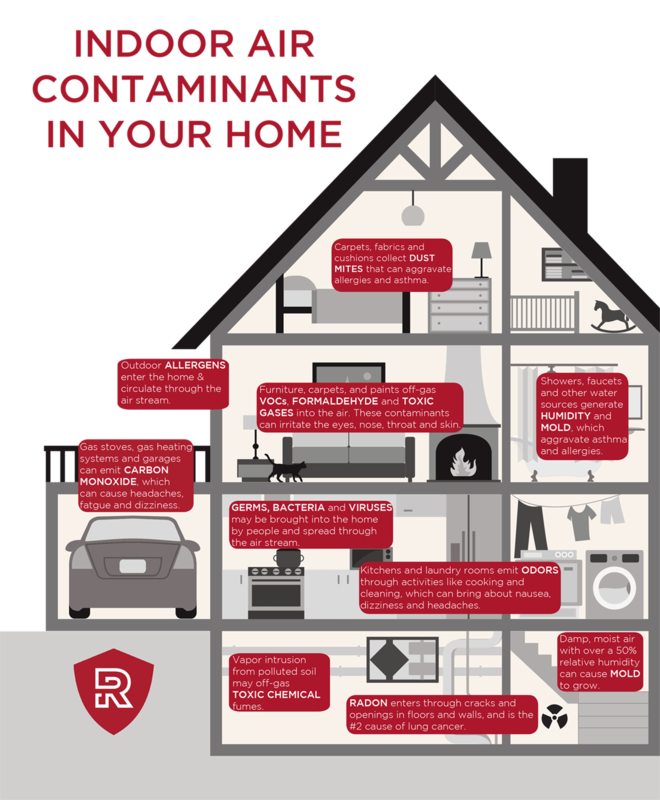 Check out the infographic below to see what types of indoor air pollutants the test might reveal and where they can be most commonly found. Energy Recovery Ventilators (ERV): Ventilation systems circulate air throughout the house which removes stale air that contains contaminants and replaces it with fresher outside air. Unlike an ordinary ventilation system, an ERV handles both exhaust and fresh air streams while also moderating temperature extremes, humidity, and removing excess pollutants like radon and carbon dioxide. ERVs are quite versatile and can handle a lot of different indoor air pollutants. However, they are particularly popular as a radon mitigation option when more traditional soil depressurization isn't cost effective or viable. Breathe EZ Air Cleaners: Traditional HVAC system air filters are designed to protect the blower motor and thus aim to capture large dust particles. This means that many of the smaller indoor air pollutants easily slip past. The Breathe EZ Air Cleaner is an electronic air filter which means it doesn't suffer from these same issues. Instead it charges particles of all sizes so they cling to the filter media. This makes it far more effective at removing contaminants of all sizes. Breathe EZ UVC Lights: A common problem with mold is that it gets into HVAC systems. When in the HVAC system it is easy for spores to spread throughout the home while the mold itself restricts airflow or otherwise damages the HVAC system. The Breathe EZ UVC Light uses UV light to kill mold spores and bacteria before they can become a problem. Dehumidifiers: Mold thrives in damp environments like basements and crawl spaces which makes it critical to control humidity with a dehumidifier. However, not just any dehumidifier can do the job. Bargain priced dehumidifiers from home centers and appliance outlets simply can't handle the sheer amount of moisture. An industrial dehumidifier like the SaniDry™ dehumidifiers we work with can. By keeping moisture under control you can stop many indoor air problems before they even have a chance to form! If you need to improve your indoor air quality then our experts can help. National Radon Defense is an international network of radon experts who are also experienced in working with a wide variety of other indoor air quality problems. Contact us today and schedule a free estimate from your local indoor air quality specialists!